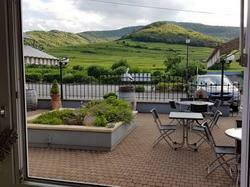 Hotel L'Orayé is set in the heart of the Alsace wine region, 8 km from Colmar. It offers en suite accommodation with free Wi-Fi internet access. Rooms at l'Orayé Hotel have a flat-screen TV with satellite channels and enjoy views of the surrounding Alsatian vineyards. Free Wi-Fi access and an LCD TV are offered in this room.